Being one of the largest countries of Europe with a favorable climate for trees France has enormous forests and lots of trees. Compared to the United Kingdom it has less old solitarian trees. The French seem to have a very practical relationship with nature: its use in the first place is economical. Still there are quite a few really old trees to be found in France. I will introduce you to some of the oldest oaks. There are also tremendous old Yews, Sweet Chestnuts, Planes, Limes and Olive - trees, but of these up till now I don't have good pictures. 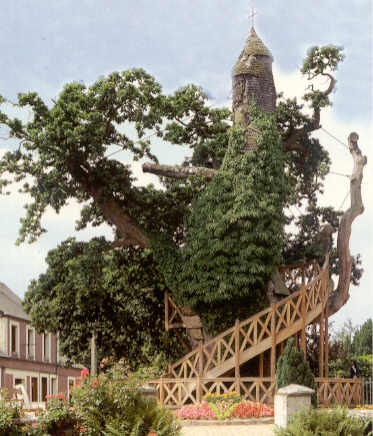 The most famous tree of France is the Chapel-Oak of Allouville-Bellefosse, a small village not far from Rouen in Normandy. In fact it is more than a tree: it is a religious monument and an object of pilgrimage. The oak itself is one of the biggest and oldest trees of France, and in it are build two small chapels above each other. Together with the large wooden staircase leading up to the chapels the whole is one of the most curious Roman Catholique sanctuaries all over Europe. About the history is known a lot: in 1669 the priest of Allouville , Abbot Du D�troit and father Du Cerceau decided to build a chapel in the already big and hollow oak, with a small altar with an image of the Virgin Mary. The chapel was dedicated to " Our Lady of Peace ". Later on a second chapel was arranged above the first and an entrance - staircase build. In it a hermit seems to have lived for some time. 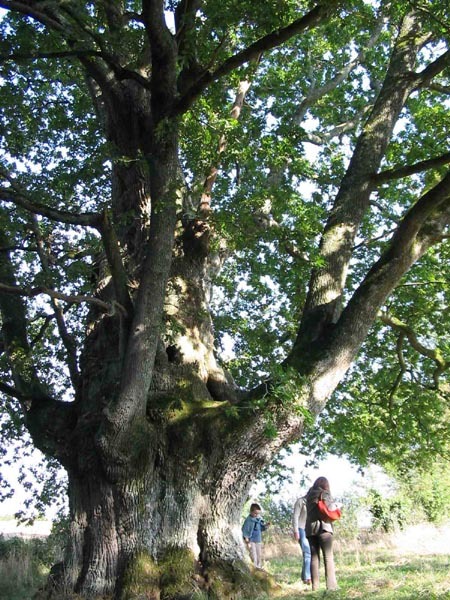 Each year about 60.000 people visit the Chapel Oak wich is a Common oak, Quercus robur, and one of the biggest and oldest oaks of France, with a girth of 10 m ( 33 feet) and an age estimated at 800 years. 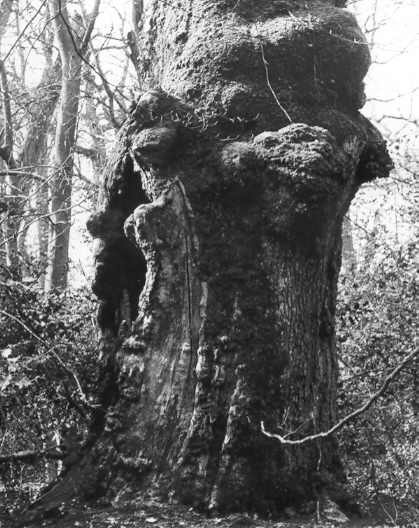 Higher estimates up to 1300 year are frequently mentioned, but not very reliable: with an age of 800 years now it would have been 470 years in 1669, old enough to have a girth of 7 to 8 m ( 23 to 26 feet) as can be seen from many other oaks. This again should have been big enough to build the chapels in it. Parts of the tree are dead, the crown has become smaller and smaller last century and dead parts of the trunk are sheltered by wooden slates. The oak is supported with poles and cables. Since 1854 twice a year the Mass is read near the oak: on the second of july ( the Patron-Saint's Day ) and on the day after the first Holy Communion. In the eastern part of Bretagne, somewhat to the west of the city of Rennes, lies the Forest of Pampoint, formerly called Ferest of Broceliande, wich was famous and legendary. In and around the forest are still several old trees to be found. Outstanding among them as for age and girth is the Oak of Guillotin, near the village of Concoret. 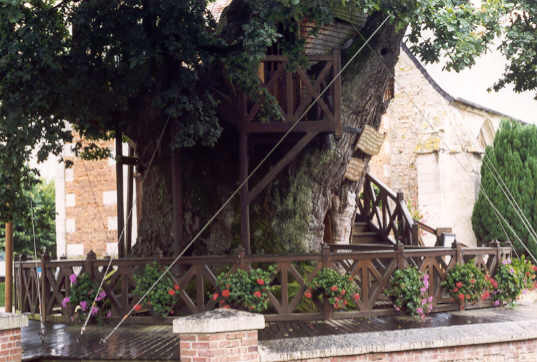 The Oak of Guillotin, with a height of 20 m and a girth of 9.65 m. To guard its roots from trampling by tourists a wooden platform with a fence was made. These pictures were send to me by Mr. Yannick Meteau. In the thinly populated hills of western Brittany, near the old village of Bulat-Pestivien, stands the presumably biggest girthed oak of France. It stands in a farmers garden, just behind the house. To see it you need to ask the farmer for permission. It is a strange tree: the trunk is split and consists of two separated parts, wich together have a circumference of 12,6 m ( 41� feet). 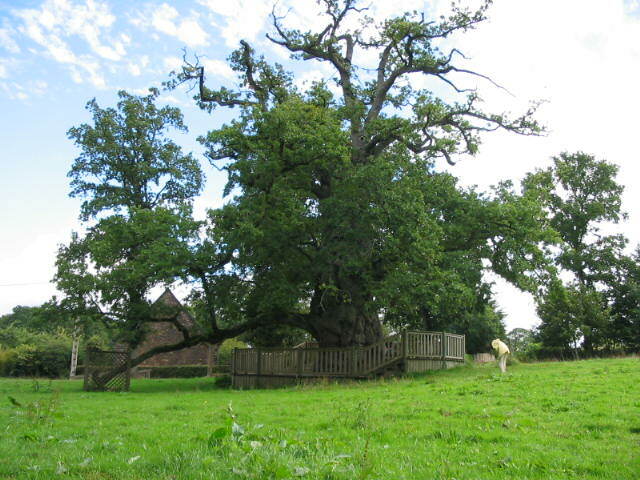 Probably the oak was pollarded once: the trunk ends rather abrubt at 2,5 metre ( 8 feet) height and divides in long branches reaching far horizontaly. The oak is only 10 m ( 33 feet) tall but has a vital crown spreading 30 m ( 100 feet). It is said to be 1000 years old, wich is not impossible with such a tremendous girth. 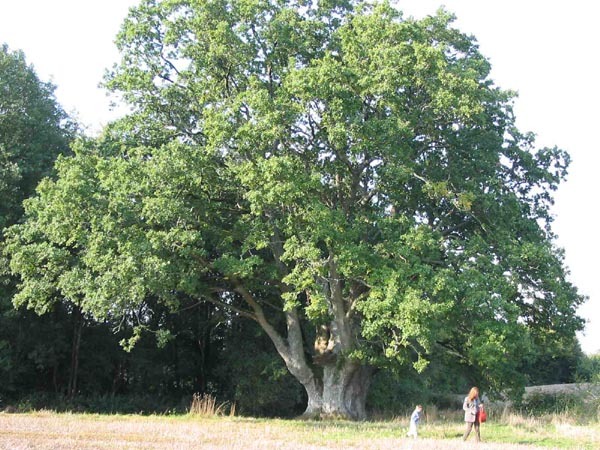 A another very big and beautiful Oak can be found at the farm La Cicogne (the Stork) near the village St.Pardoux, 125 km west of the city of Poitiers in the district Poitou-Charentes. The Oak is called Ch�ne de la Cicogne; during the French Revolution a certain Fran�ois Robert le Chouan had a superb hiding place in the hollow trunk. The Oak of St.Pardoux is known as one of the oldest in France. Research should have proven that it is about 1000 years old. Although its circumference near the ground is 11,4 m and at breasthight about 8,5 m, I think this estimate is to high. I guess the age will be nearer to 500 years. 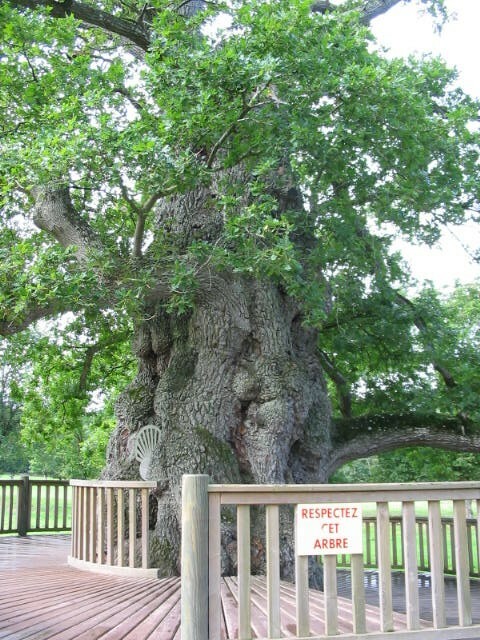 Another Oak wich really can be 1000 years old, is the Ch�ne de Montravail near Saintes. Oaks in the " For�t de Fontainebleau "
One of the largest and most beautiful forests of France is the Forest of Fontainebleau, somewhat to the south-east of Paris. Large parts of the forest consists of old deciduous forest, especialy oak and beech - forest. From the 16th century oaks have been planted here for wood production. Famous are the oak-plantings done under Louis XIV by his minister Colbert around 1680. Parts of them still exist in Fontainebleau and some other french forests like the For�t de Bell�me and the For�t de Tron�ais. The forest of Fontainebleau was celebrated already in the 19th century because of its picturesque rocklandscapes and splendid old forests. Mainy painters came here to be inspired. They achieved the creation of several "artistic reserves" in 1853: this were some very old and beautiful parts of the forest wich they wanted to save from the axe. These reserves exist till this day: the policy in some of them has been to leave everything to natural processes. This has lead to interesting developments: the former open forest with dominating old oaks has changed in a much denser beech-dominated forest. Still, this forests have a very varied and natural structure, with ancient trees, dying trees, dead standing and fallen trees, often full of mosses and mushrooms, open spaces and young trees reaching to the light in the gaps in the canopy. 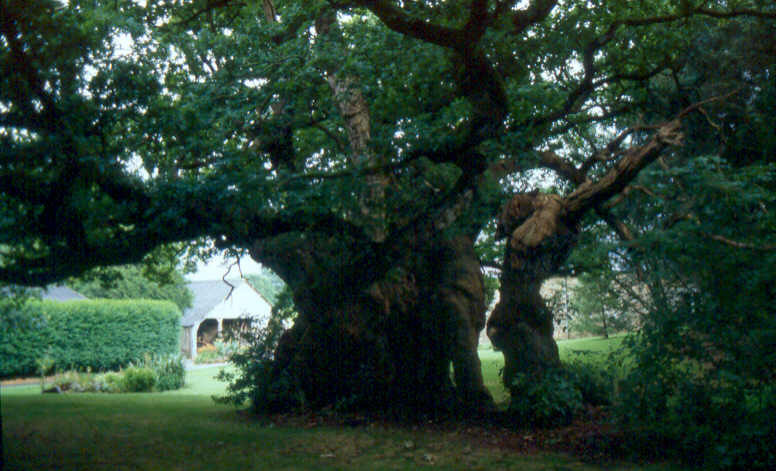 Here you see an ancient oak in one of the reserves, "Le gros Fouteau". 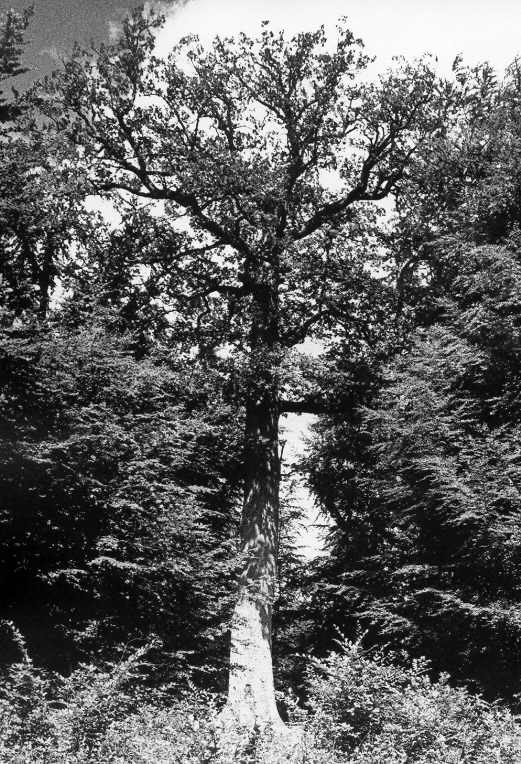 The most famous oak of Fontainebleau up to recently was the Ch�ne Jupiter, the Jupiter Oak, here still in full glory in 1975. The author can just be seen to the right of the trunk. Like most oaks in Fontainebleau it was a Sessile-Oak, Quercus petrea, wich grow better than common oak on the soils of this area. It had an age of about 450 years, stood 35 m (115 feet) tall and had a circumference of 6,8 m ( 22� feet). It was a typically forest grown tree, with a long trunk going up to 25 m (82 feet), the first branche growing at 17 m ( 56 feet). The ideal timber-tree for the forester, but it was saved for saw and axe. In 1993 I visited Jupiter for the last time and it was looking badly. Recently it has died. Here some more photos of the Jupiter Oak. A somewhat smaller forest is the Forest of Bell�me, west of Chartres in the district Le Perche. It also has beautiful old oak-forests. This is the splendid Ch�ne de l'Ecole - the "Oak of the School" , a Sessile Oak planted by the above mentioned Minister Colbert, around 1675. It is the antipole of the Tronjoli Oak above: it stands 42 m (137.8 feet) tall with a branche-free trunk of 25 m (82 feet) long and 455 cm (15 feet ) girth. 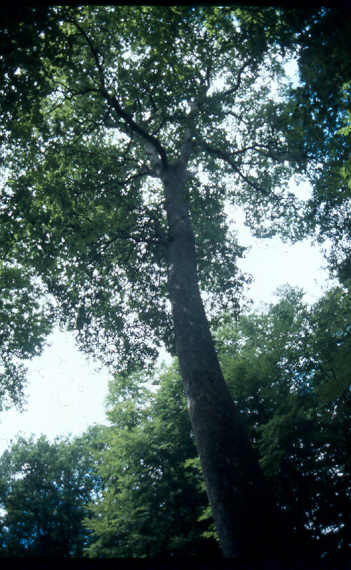 More of such tall old Sessile oaks can be seen in several other forests in France, like the Forest of Tron�ais, North-West of Moulins.